YES! YES! YES! YOU CAN VIDEO POLICE!!!! Here’s a National post article on your right to video and photograph agents of the state in Canada (police, CRA you name it). Karen is a lawyer and works with Canadian Constitution Foundation. The below is a lawyer’s opinion not some average man or woman with no official legal training and no license to practice law. Maybe what she says carries a bit more weight with you?? She deals with these issues in court. 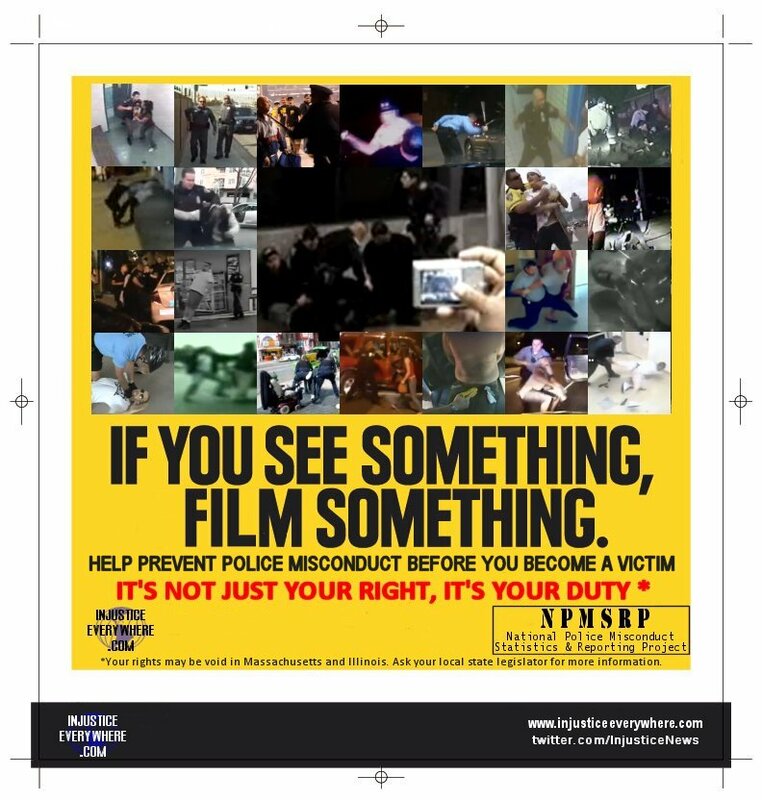 Apparently canadian police have a policy of trying to hide their criminal actions by “not allowing” or seizing cameras that are being used to video their criminal acts. Too harsh you say? Well, if they did not have anything to hide then they would not mind being videoed. Isn’t that the line they use ALL THE TIME when they invite us to waive our rights? FACT THREE: People have to hire a lawyer, or do it yourself, and threaten court proceedings to get remedy because the police take the stance “We can do whatever we want.” and until they get charge, prosecuted, fined, fired, jailed……they are right. FACT FOUR: It’s up to each and everyone of us to hold them accountable or things will only get worse. I’ve highlighted some key points in her article and added a couple of editorial comments in [ just my biased opinion ]…..
What have cops got against cameras these days? Increasingly, people are getting arrested, charged or even assaulted by police officers, merely for attempting to take photos or videos of officers at work. Often, police simply command people to stop photographing. Scared into thinking they must be breaking some law, citizens comply. When Polish visitor Robert Dziekanski died after being tasered at the Vancouver airport in 2007, police seized the now famous video made by witness Paul Pritchard, who had to hire a lawyer and threaten court proceedings to get it back. The phenomenon struck close to home on August 2 when I got a phone call at 7:30 a.m. from my client Montana Jones telling me that numerous officers were at her farm with a search warrant. Ms. Jones is suspected of complicity in making 31 rare Shropshire sheep disappear from her farm before they could be seized and killed by the Canadian Food Inspection Agency (CFIA) on suspicion of disease. (Incidentally, when 26 of the missing sheep were eventually found and killed two months later, all tested disease-free.) [criminal actions by the CFIA I’m sure. These were genetically pure, rare sheep… a threat to the GMO and mono culture culture of government and CFIA…who wanted them dead and closer to extinction]. Although Ms. Jones has not been charged with anything, the only phone call the police would let her make was to me, her lawyer. She asked me to call a couple of her friends who live nearby and have them come over to videotape the proceedings. Two friends arrived at separate times with their cameras, but an officer stationed at the farm gate denied them entry and forbade them to take photos. “I have my orders,” was his only explanation. One of the friends returned later carrying only a pen, her wallet and identification. After being threatened with arrest if she dared walk up the driveway, she was finally allowed entry by a more senior member of the investigation team, but was again warned that she had better not be carrying a cell phone or any other data recording device. There is no law in Canada that prohibits people from openly photographing police. Section 129 of the Criminal Code prohibits “wilfully obstructing” police in the execution of their duty, but it is hard to imagine how standing by peacefully and videotaping as police searched the premises and piled up items for seizure could be considered obstructing. After all, the police themselves were videotaping on Ms. Jones’ premises — but selectively. They probably didn’t capture themselves ordering her friend to refrain from taking the pictures she was legally entitled to take. That same day, three other search warrants were executed at the homes of other individuals the CFIA suspects of conspiring with Ms. Jones to save her healthy sheep. At Michael Schmidt’s residence, all cell phones were immediately confiscated. When a visitor from outside arrived with his cell phone, Schmidt’s wife borrowed it and took photos of police inside her home. Officers seized the phone even though it was clearly outside the scope of the warrant. They returned it three hours later, with the photos erased. When the victim of this apparently illegal seizure objected, police responded, “We can do whatever we want.” But of course, that arrogant response was not permitted to be recorded. That willful destruction of data by police probably constitutes the offence of mischief under section 430(1.1) of the Criminal Code [how about destroying evidence???]. The possibility of the victim laying charges is being investigated. [If they are not pursued with FULL vigour then the victim is giving the police free reign to continue their illegal actions]. Police must be made to understand that being on duty or executing a search warrant does not transform an officer into a petty dictator with carte blanche to issue arbitrary orders to everyone in sight. Police cannot do “whatever they want.” Citizens have the right to hold them accountable for their actions. Personal cameras are important tools in implementing that right. Bullying people out of using them must cease. The Baltimore City Police Department is being sued for allegedly seizing and deleting the contents of a man’s cell phone after he recorded officers making an arrest. Recently, the U.S. Department of Justice — which appears to have intervened in the lawsuit — issued guidance to the Baltimore Police recommending that it affirmatively assert individuals’ constitutional right to observe and record police while discharging their duties. Let’s hope this triggers a sea-change in police attitudes not only south of the border, but here in Canada too. [never without citizens suing the police for these acts which are an attempt to coverup their crimes]. 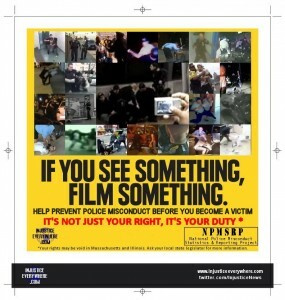 IMAGE CREDIT- http://www.policemisconduct.net/the-worst-police-misconduct-videos-of-2011/ if you are into police brutality reality tv they have “The fifth worst police misconduct videos of 2011″ for your viewing uhhh…pleasure…if you have the stomach.